Each year I try to implement new gardening techniques that get more results with less work. This year I’m adding winter sowing to that list. Is winter sowing right for you? Almost everyone in North American can benefit from winter sowing milkweed seeds. The few exceptions are those that live in regions without a true winter. 1. Winter weather provides a natural cold stratification process. When seeds are subjected to cold before gradual warmth, this breaks their dormancy and causes them to sprout. Warm weather varieties (e.g. tropical milkweed) don’t require this. All of the species listed here do require cold stratification, which makes them good candidates for winter sowing. 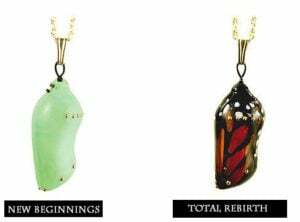 Each link below will take you to a plant page or order page. You will be able to purchase milkweed seeds from both. 2. Seedlings sprout early inside their miniature greenhouses giving you a head start on garden season and north-migrating monarch butterflies. 3. You have more control of where plants grow. If you direct sow in fall or spring, seeds can get moved around by weather or wildlife before they germinate. Some start sowing as early as the winter solstice (which is just before Christmas). Earlier start dates are recommended for those further south, since freezing temps are in shorter supply. I’ve started milkweed seeds inside before with less than one month of ‘refrigerator’ cold stratification. Starting seeds by February should be more than enough time (in most regions) to create the desired outcome. Native milkweed is the cornerstone of a successful butterfly garden, so start with those species if you are just getting started. Once you have natives established, consider other non-invasive varieties to attract even more butterflies. What’s native to your region? 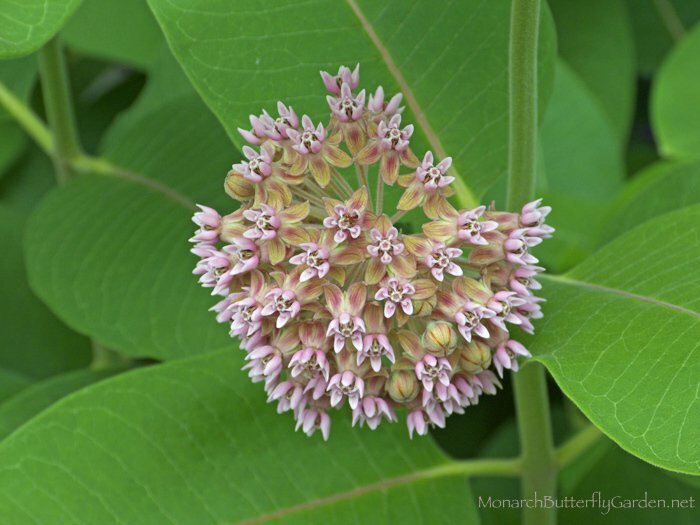 Check out my milkweed resources pages, which lists the native region for 25+ milkweed varieties. Make sure all winter sown milkweed species require cold stratification. Winter sowing warm weather milkweeds including tropical, swan, and giant could kill your seeds. Winter sowing milkweed doesn’t require a huge investment (of your time or money!) and the rewards can be quite substantial when spring rolls around. You’ll be happy to learn most of the tools needed are already inside your home. 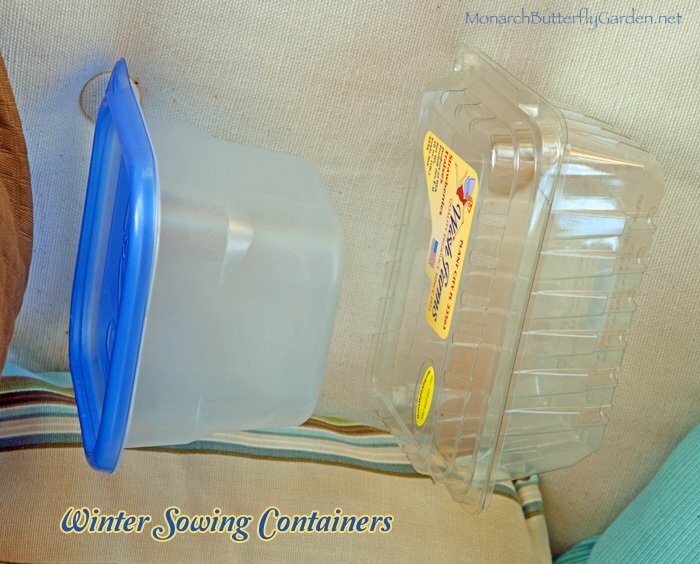 What Winter Sowing Containers Do You Already Own? These are some container options that have been successfully used by other gardeners. Consider trying a couple methods to see if one works better for you. Keep in mind all containers must also be clear enough to allow light to penetrate the soil. 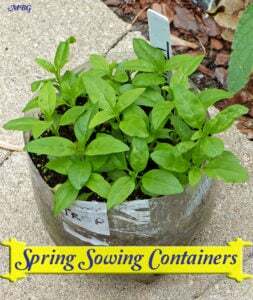 Any container should have the ability to hold up to 4″ of soil, with ample room up top for seedling growth. Over the past two cold, wet springs (in Minnesota) we have had problems with M&Ms…mold and moss! This has only been in an issue in the opaque milk jugs that receive less light. We’ll still use opaque milk jugs, but will add more drainage holes growing forward. Use a good all-purpose potting soil, seed starting mix or make your own. Do not use a moisture-control variety, because excess moisture could lower germination rates for some milkweed species. We use pro-mix which has sphagnum peat moss and perlite mixed in to allow more air around developing plant roots and improve drainage. We are also experimenting with the seed starting mixes. Duct tape, a scissors or box cutter, a marker for outdoor use, sturdy plant labels, and a drill (or something that will make drainage holes in your plastic containers). I just received some local milkweed seeds (well actually I got a Pod) and I was going to Cold Straiate then in the fridge for 30 days, then germinate them in Peat pots – guessing this would then put them best for fall planting but they will have germinated and started growing by the time winter rolls around – will this hurt the new little plants? Hi Christine, if you’re in a region with a true winter, I would skip the CMS and just fall plant the seeds. Hello. I am in central Ohio, about 20 miles south of Columbus. We collected milkweed seeds this past fall. I believe it is too late to put them outside in plastic jugs for winter stratification. Do you recommend putting them in the refrigerator now until we plant them in April? We are doing an Earth Day event with the Girls Scouts and I’m just trying to make sure we have the most successful pollinator garden possible. I am in the Northeast Region, and the milkweed that is native to the area is Asclepias incarnata (swamp milkweed). I’ve tried looking everywhere, but can’t seem to find this variety in stores. I have Home Depot, Walmart, and some other stores. I am trying to keep it to the native variety. Any suggestions on where I can find this? Hi Barbara, if you want seeds, these will be easy to find online in the suggested milkweed stores section…plants should be easier to find closer to spring. Are there any milkweed types that aphids don’t really like ? unfortunately, I’ve pretty much seen them on all milkweed varieties…probably least on A. tuberosa, but that’s not a monarch favorite either. Hi Tony. Glad I found your site. This is the first year I’m planting milkweed (swamp) and other flowers specifically to attract the Monarchs. I grow all my flower and vegetable plants and keep the seeds in airtight freezer bags with silica gel and packed in a plastic container. Reading your article here, I’m late getting started with the Milkweed, and possibly with the Marsh Mallow too. Since I have the seeds in the freezer, does that count toward stratification and, if not, can I at least cut down the time in the refrigerator? I’m in south central Missouri and plan to grow the plants inside. Also, should I avoid putting the planted seeds on the heat mat with other seed starts? They’ll be under lights in a cool basement. I also have a plastic tunnel on my raised garden bed and can put plants out in peat pots in early spring if that’s better. Have never been so paranoid a planting a seed before! But I want those Monarchs back. Appreciate your your work to save the Monarchs. Also, I only use a heat mat until the seeds have germinated. Yes, you could try some seeds in your raised bed set up to. It’s always good to try a couple different propagation methods to seed what works best in your region…good luck! I followed your instruction for sowing milkweed seeds in containers last winter and had great success. I started a 10’x40′ milkweed garden in the spring and had many cats by mid-late summer. I even bought one of your tents and watched some of them pupate up close. BTW, the Monarchs seemed to prefer the red milkweed for their eggs over the common milkweed. I have a question for you. Is the “greenhouse” effect of the containers important? I have a salad table outside that I used for sowing seeds this time which I covered with hardware cloth to keep the birds off. Will this work? (I also started several containers for insurance.) The table won’t provide a greenhouse for the seeds, but it will allow the winter weather to have its effect. What do you think? Hi Kellie, congrats on your sowing success! The greenhouse effect increases the speed of germination…obviously you don’t ‘need’ it if you think about all the seedlings that come up in your garden each spring. Gardening is all about experimentation and different propagation techniques work better/worse depending on your region. I’m sure covering with hardware cloth will work, but the seeds might not germinate as quickly…good luck! 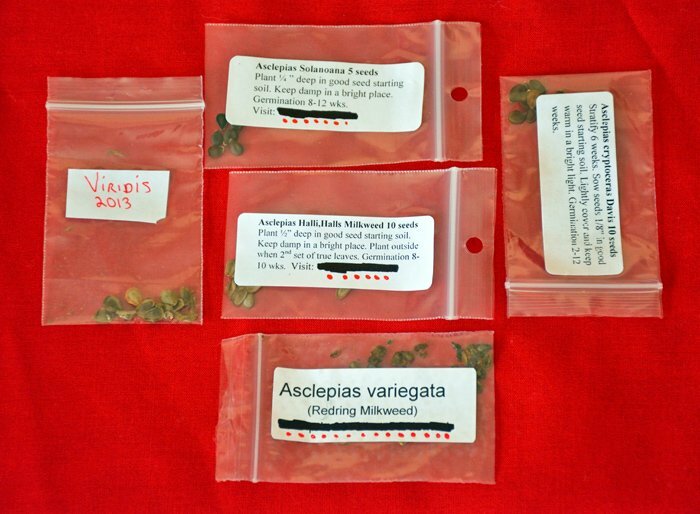 I collected my milkweed seeds last fall, made sure they were dry and placed in zip baggie. But I thought I was to store in freezer until this spring. I am confused as to whether I was to store in freezer or refrigerator. Help… I hope I didn’t ruin the seeds. Hi Laurie, some people store their seeds in the freezer or refrigerator….I store mine in a cupboard. As long as they’re not warm weather varieties, your seeds should be fine. Hello everyone, I have a question… and a bit of a problem, I have recently found some milkweed seed pods with most of the seeds missing, and I’m not sure what type of milkweed it is so I’m not sure when or how I should plant the seeds. Happy early almost spring! And thank you to anyone that helps! Hi Madison, it’s a lot easier to start seeds when you know what you’re planting. Otherwise, it’s just a guessing game. You could still try winter sowing (if you’re in a region with a true winter) and reserve a separate spot in your garden to plant the seedlings. Once you figure out what they are, you can transplant them if needed. good luck! Winter sowing as described in the article works, I’ve done it successfully. However, it’s far better and easier to grow more much easier under grow lights but you must cold stratify. Hello and happy January. I will be sowing on Sunday! I just got into this and have LOTS of extra seed in case someone wants some. They are common milkweed from Michigan. I have 5 people already at work that planted seeds in December, and my sister took some to plant near her home. My question is this: How many plants do you need for each cat? I have about 100 seeds planted in three containers so far and will sow more tomorrow. Thanks for the great work and info you are doing. Love it!! Hi Cindy, over two weeks it takes just 1-2 caterpillars to finish off an entire milkweed plant. It sounds like you should have plenty of milkweed available when they monarchs make it back to Michigan this summer. Tony, I’m growing tropical milkweed cuttings indoors for the first time this year and I can’t get rid of the aphids!I followed your instructions in the blog and am using the hydrogen peroxide spray you recommend, but they keep coming back. I’ve taken to squishing them, but it’s really starting to take a toll on the plants. How can I get rid of them? Can I use real pesticide since we’re many months away from the cats feasting on them? Hi Sue, hydrogen peroxide kills fungus gnat eggs in the soil, but not aphids. Tony thanks so much. They’ve been driving me crazy. Oh I’m gonna get them now! So I am in Southern Ca. and have difficulty propagating narrow leaf milkweed seed. Any suggestions? Regarding winter sowing in containers, which is the the best type of soil to use: starter mix, potting mix, or potting soil? Isn’t potting soil heavier than the others? I love in Ellsworth, Maine. We have milk weed all over the place. A neighbor has a whole field of it! You mentioned once that it doesn’t transplant well. I’m thinking you meant transplanting from the ground from and established field. I don’t even know what kind of milk wee we have! Is there any way you can help me out? It is pink and smells sweet. The seeds need to be in the frig for a month starting at the end of December? Just read through steps one and two – live in Northern MN. Will try the “winter method” with my seeds, in February. Do I leave the seeds in the baggies for now? Sealed or open? Hi Kim, as long as the seeds are completely dry you can seal the bag. Mold issues only occur when seeds are wet. I let seeds sit in a bowl 24 hours before storing them. Hi Matt, thanks for the great info. I’d just like a little clarification. I harvested some milkweed pods from a field near me. the pods opened easily and the seeds are brown. I live in Ohio so I will get a good winter and would like to winter sow them, probably right after Christmas. what do I do with the seed pods until then, that’s a good 3 months. do I seperate the seeds and put in plastic bags? I worry about mold. or just leave it all together pods and all and let dry naturally? thanks, I appreciate your help! I enjoy this so much. A good friend I used to work with (she retired) used to bring in this 3 sided glassed box where she used to have the monarchs pod on the top. She would bring it in to the residents of our nursing home and they would enjoy watching the process. She would let them bring them out to fly free when they were ready. Its such an easy thing to do and so helpful. Really Really cool!! I love it. I will be doing this process too. Thanks for doing this. I’ve got my milkweed seeds stratifying in slightly moist sand to plant soon. 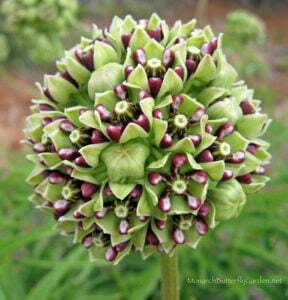 Wherever did you get the redring milkweed seeds as the plant is supposedly ever so rare? Ready for super sow Sunday but it might be on Monday that they get planted. Hi Brian, I had gotten them from a gardener a while back and the seeds weren’t viable. Every once in a while, I’ll search for seeds online but no luck. One of these years, hopefully…good luck with your winter sowing containers! Hi Tony, I have had a surprising experience. Here in southern Louisiana we have not had a cold winter. The few times we have had a freeze I have covered up my milkweed trying to save it for the coming year. It is growing fine and blooming too. Well yesterday I go out to check the plants in the garage and to start planting my seeds for the winter in my trays when I all of a sudden I see a cat! I also had to cover the plants outside for a freeze last night. Well I searched all the milkweed in the yard…I have 9 cats! My questions are 1) I have enough milkweed to get them through but what about the butterflies? I don’t have any flowers. 2.) Are these still the super butterflies that live 6 months? Can they still make it to Mexico? They are roughly about two weeks old now. I have gathered them together and have them inside now to keep them warm. Hi Jackie, what an unexpected January surprise! I don’t think butterflies will migrate this late in the season, but who knows? They could possibly survive winter in your region if you temps remain on the mild side…if they stay, they will probably live out a shorter life span like summer monarchs. It is possible they could mate with returning migrators. If they eclose during a cold spell, you may have to keep them a few days. In that case you would need to feed them. 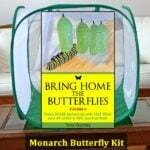 There is some info on this post about feeding/releasing adult butterflies. Good luck with your first batch of the new year! Question: I’ve brought several milkweed pods from NH to Long Island NY. Can you provide info to help them survive in this different climate zone please? Thanks! how do you get milkweed over the winter? I started a butterfly garden a few years ago and this past summer collected all my milkweed pods to donate and give to friends to help promote native host plants for Monarchs. My concer however is that I gathered all the pods at the summers end and they’ve been on a shelf in the house since. They seem very try and brittle now. Does mean they will be no good now for winter sowing and harvesting? Hi Zack, is it possible you picked the pods before the seeds were ripe? We typically separate all our seeds when we harvest them and store them in paper or plastic bags once they are fully dry. It can’t hurt to try winter sowing, but make sure you have an alternative source for seeds or plants if things don’t work out…good luck! This is the first year that I have collected warm weather milkweed seeds (tropical and goose/balloon). I have read that the refrigerator is generally the best place to store seeds as long as you keep your seed storage containers away from the freezer section of your refrigerator. I was wondering, how do you store your warm weather milkweed seeds over winter? Hi Brian, I just keep mine stored in a cupboard, and then soak them in warm water 24 hours before planting. Quick question about planting of milkweed seed. I have read some information from other sources that say that milkweed seeds need light for germination and therefore should not be covered with soil when planted. Can you comment on this? Here in Iowa, I will be working to establish Sullivant’s milkweed, Butterflyweed, and swamp milkweed. 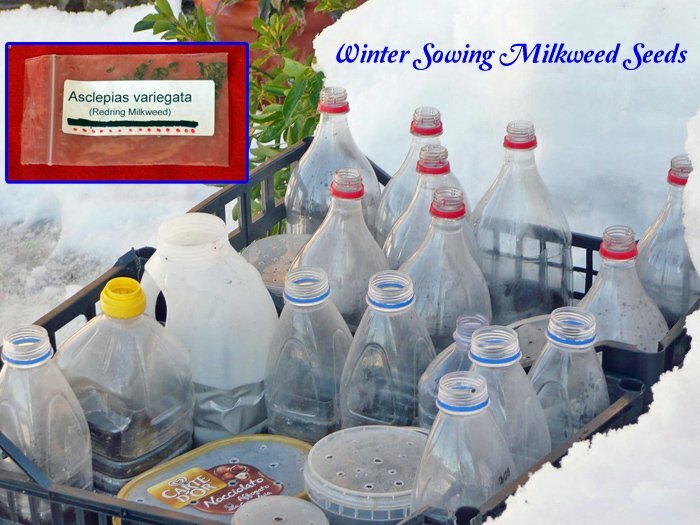 the 3 milkweed species you are growing require cold stratification. You can do this naturally with winter sowing or place seeds in the refrigerator in late winter and spring. I plant seeds about 1/4″ deep and cover with soil. You should have good germination rates this way, provided you have viable seeds.